Suzuki SX4 Review: I’m going to let you in on a little secret, Suzuki sells a really fun, practical and sporty hatchback that you may not have considered. Since 2007, the SX4 has been displayed in Suzuki showrooms across the country, offering the least expensive all-wheel-drive car you can buy. Its four-door sedan sibling, the SX4 Sport, arrived later, ditching the all-wheel-drive for a lowered stance, larger alloy wheels and more on-road amusement. Natural, then, is the genesis of the Sportback, which combines the practicality of the five-door, seat-folding cargo hauling with the urban motoring experience. What you get is a sweet handling, stuff carrying, stylish little runner for less than $18,000. Oh, and to sweeten the deal, it comes with a standard navigation system, which not only directs you to your destination, but also provides you with real-time traffic, weather, movie times, stock updates, headlines, lowest gas prices finder, airline arrival and departures times and on-screen Bluetooth text message displays. Whew! I had some fun with this little system. For one thing, my tester was Quicksilver Metallic ($130 extra) and the small navigation screen showed a little silver SX4 on the road. Cute. The system is obviously an add-on, and it pops up on a little door at the top of the dash, but it was easy to use, despite being a long reach to the touch screen. I was amused by the system’s occasional mispronunciations (“Lake Chabbit” for Lake Chabot, for example) and annoyed when it would, out of nowhere, state “Traffic ahead” without any further elaboration (what was I supposed to do about it?). It did announce my turns at exactly the right time however, and would willingly recalculate when I strayed from the prescribed route. This modest but handsome little vehicle is loaded with upscale features. The surprisingly attractive interior comes standard in this model with automatic air conditioning; power windows, power locks and mirrors; cruise control; leather-wrapped steering wheel with audio controls and a trip computer. The silvery accents go a long way to relieving the stretches of black plastic, and the little triangular windows in the windshield pillars reduce their massiveness. Mechanically, the engine is upgraded to 150 horsepower and 140 lb.-ft. of torque this year. You can get a snappy six-speed manual or a continuously variable automatic transmission with racing-style paddle shifters on the wheel. Beyond that, standard Electronic Stability Control (ESP) with four-wheel disk brakes and ABS uses the car’s computer to keep this front-wheel-drive car on the road when it gets slippery. With two liters of displacement moving 2,700 pounds, you can expect good fuel economy as the little Sportback earns 22 City and 30 Highway with the six-speed manual transmission. EPA Green Vehicle Guide numbers of 6 for Air Pollution and 7 for Greenhouse Gas give the Sportback entry into the SmartWay group, your best choices for green driving. I got 27.4 mpg in an honest week of varied urban motoring. Of course with a small car one wonders about safety. Despite offering mostly four-star rather than five-star crash ratings, the Sportback offers a full complement of airbags, crush zones, and all the usual standard features that one expects these days. Europeans have known this for years, but hatchbacks are really great for turning a small car into a hauling wizard. The SX4 can handle 54 cubic feet of stuff when you drop the seats. Drop in that flat-screen TV from Costco or your personal musical gear, it’s got the room for it. When you’d rather carry people you still get 16 cubic feet, up to the roof, if you need it. Prices for the SX4 Sportback start at $17,949, and you really don’t need anything else. My tester had floor mats and a cargo net. Well, OK, these are nice to have, plus the previously mentioned metallic paint and Bluetooth with message display for $259. The total MSRP price came to $18,513. You can add the CVT transmission if you want for another $1,150. But don’t just take my word for it. Consumer Reports 2009 annual auto issue recommends the SX4, with top red dot ratings in reliability and consumer cost. In addition, Kelley Blue Book's kbb.com has recognized the SX4 as one of its "Top 10 Coolest Cars Under $18,000," while my colleagues in the New England Motor Press Association (NEMPA) have awarded the SX4 with its "Yankee Value Award" for three consecutive years. I imagine the all-wheel-drive SX4 Crossover does especially well in snowy climes. 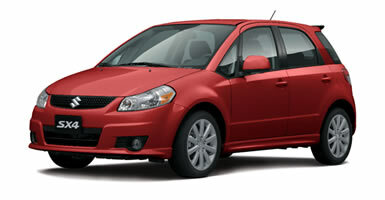 The Bottom Line: The 2010 SX4 Sportback might be the best deal Suzuki has to offer in these tough economic times. For around $18K you get all wheel drive, 50+ feet of cargo area, 30 MPG highway and a built in Nav system. Plus all the standard goodies one would want to make a day outing or work commute a really enjoyable trip. Combined with a fantastic warranty, and at a price that everyone can afford, it’s a car that makes driving fun again, on the road and at the pump.